This is the second in the series of three articles discussing the interstate freeway system of the Portland metropolitan area. That prophetic statement was made in the Oregon State Highway Department’s Technical Report No. 55-5, published in June 1955. The report was a comprehensive discussion of 14 freeways, 14 expressways and 24 major streets studied in connection with a freeway and expressway system for the Portland metropolitan area. Some of the freeways have been constructed and are in use (Banfield and Baldock). Some were dropped from consideration after the Federal Highway Act of 1956 made more money available and imposed new construction standards. The East Bank is under construction. 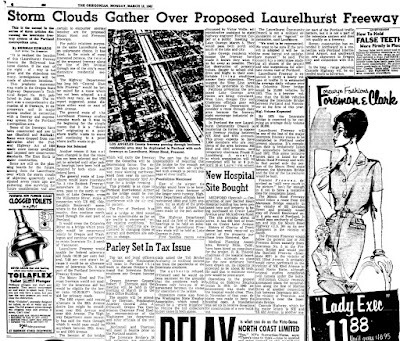 Some are still on the planning boards for the future, among them the Laurelhurst over which the storm clouds of objection apparently anticipated seven years ago are gathering. Also surviving for future consideration and also certain to encounter stormy weather are the proposed Mount Hood and Fremont freeways. 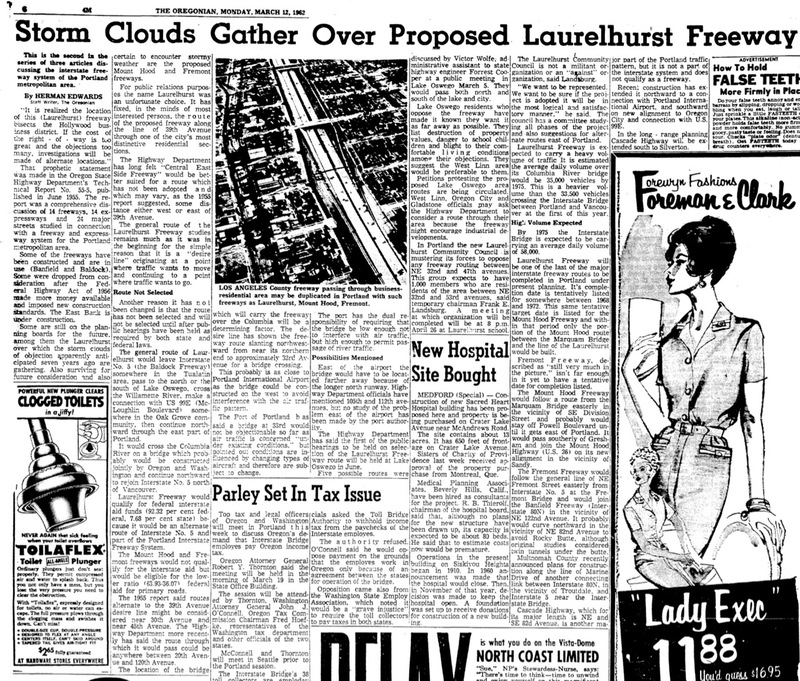 For public relations purposes the name Laurelhurst was an unfortunate choice. It has fixed, in the minds of most interested persons, the route of the proposed freeway along the line of 39th Avenue through one of the city’s most distinctive residential sections. The Highway Department has long felt “Central Eastside Freeway” would be better suited for a route which has not been adopted and which may vary, as the 1955 report suggested, some distance either west or east of 39th Avenue. The general route of the Laurelhurst freeway studies remains much as it was in the beginning for the simple reason that it is a “desire line” originating at a point where traffic wants to move and continuing to a point where traffic wants to go. Another reason it has not been changed is that the route has not been selected and will not be selected until after public hearings have been held as required by both state and federal laws. The general route of Laurelhurst would leave Interstate 5 (the Baldock Freeway) somewhere in the Tualatin area, pass to the north or the south of Lake Oswego, cross the Willamette River, make a connection with US 99E (McLoughlin Boulevard) somewhere in the Oak Grove community, then continue northward through the east park of Portland. It would cross the Columbia River on a bridge which probably would be constructed jointly by Oregon and Washington and continue northward to rejoin Interstate 5 north of Vancouver. Laurelhurst Freeway would quality for federal interstate aid funds (92.32% federal, 7.68% state) because it would be an alternate route of Interstate 5 and part of the Portland Interstate Freeway System. The Mount Hood and Fremont freeways would not qualify for the interstate aid but would be eligible for the lower rate (63.93-36.07) federal aid for primary roads. The 1955 report said routes alternate to the 39th Avenue desire line might be considered near 30th Avenue and near 45th Avenue. The Highway Department more recently has said the route through which it would pass could be anywhere between 20th Avenue and 120th Avenue. The location of the bridge which will carry the freeway over the Columbia will be a determining factor. The desire line has shown the freeway route slanting northwestward from its northern end to approximately 33rd Avenue for a bridge crossing. This probably is as close to Portland International Airport as the bridge could be constructed on the west to avoid interference with air traffic pattern. The Port of Portland has said a bridge at 33rd would not be objectionable so far as air traffic is concerned “under existing conditions,” but pointed out conditions are influenced by changing types of aircraft and therefore are subject to change. The port has the dual responsibility of requiring that the bridge by low enough not to interfere with air traffic, but high enough to permit passage of river traffic. East of the airport the bridge would have to be located farther away because of the longer north runway. Highway Department officials have mentioned 105th and 112th avenues, but no study of the problem east of the airport has been made by the port authority. The Highway Department has said the first of the public hearings to be held on selection of the Laurelhurst Freeway route will be held at Lake Oswego in June. Five possible routes were discussed by Victor Wolfe, administrative assistant to state highway engineer Forrest Cooper at a public meeting in Lake Oswego March 5. They would pass both north and south of the lake and city. Lake Oswego residents who oppose the freeway have made it known that want it as far away as possible. They list destruction of property values, danger to school children and blight to their children and blight to their comfortable living conditions among their objections. They suggest the West Linn area would be preferable to them. Petitions protesting the proposed Lake Oswego area routes are being circulated. West Linn, Oregon City and Gladstone officials may ask the Highway Department to consider a route through their area because the freeway might encourage industrial developments. In Portland the new Laurelhurst Community Council is mustering its forces to oppose any freeway routing between NE 32nd and 47th avenues. This groups expects to have 1,000 members who are residents of the area between NE 32nd and 53rd avenues, said temporary chairman Frank E. Landsburg. A meeting at which organization will be completed will be at 8 p.m. April 26 at Laurelhurst school. The Laurelhurst Community Council is not a militant organization or an “against” organization, said Landsburg. “We want to be represented. We want to be sure if the project is adopted it will be in the most logical and satisfactory manner,” he said. The council has a committee studying all phases of the project and also suggestions for alternate routes east of Portland. Laurelhurst Freeway is expected to carry a heavy volume of traffic. It is estimated the average daily volume over its Columbia River bridge would be 35,000 vehicles by 1975. This is a heavier volume than the 33,500 vehicles crossing the Interstate Bridge between the Portland and Vancouver at the first of this year. By 1975 the Interstate Bridge is expected to be carrying an average daily volume of 58,000. Laurelhurst Freeway will be one of the last of the major interstate freeway routes to be completed in Portland under present planning. It’s completion date is tentatively listed for somewhere between 1968 and 1972. This same tentative target date is listed for the Mount Hood Freeway and within that period only the portion of the Mount Hood route between the Marquam Bridge and the line of the Laurelhurst would be built. Fremont Freeway, described as “still very much in the picture,” isn’t far enough in it yet to have a tentative date for completion listed. The Mount Hood Freeway would follow a route from the Marquam Bridge easterly in the vicinity of SE Division Street and probably would stay off Powell Boulevard until it gets set of Portland. It would pass southerly of Gresham and join the Mount Hood Highway (U.S. 26) on its new alignment in the vicinity of Sandy. The Fremont Freeway would follow the general line of NE Fremont Street easterly from Interstate 5 at the Fremont Bridge and would join the Banfield Freeway (Interstate 80N) in the vicinity of NE 122nd Avenue. It probably would curve northward in the vicinity of NE 82nd Avenue to avoid Rocky Butte, although original studies considered twin tunnels under the butte. Multnomah County recently announced plans for construction along the line of Marine Drive of another connecting link between Interstate 80N, in the vicinity of Troutdale, and Interstate 5 near the Interstate Bridge. Cascade Highway, which for SE 82nd Avenue, is another major part of the Portland traffic pattern, but it is not a part of the interstate system and does not quality as a freeway. Recent construction has extended it northward to a connection with Portland International Airport, the southward on new alignment to Oregon City and connection to U.S. 99E. In the long-range planning Cascade Highway will be extended south to Silverton.